Vaishnavite Temples have varieties of prasadams and I always wonder the unique taste of the prasadams. 'Thirumaalai chamba' is a prasadam made in 'Thirukoshtiyur' Divyadesam. This prasadam is made and offered to Sowmyanarayana Perumal every evening immediately after decorating Perumal with garlands. 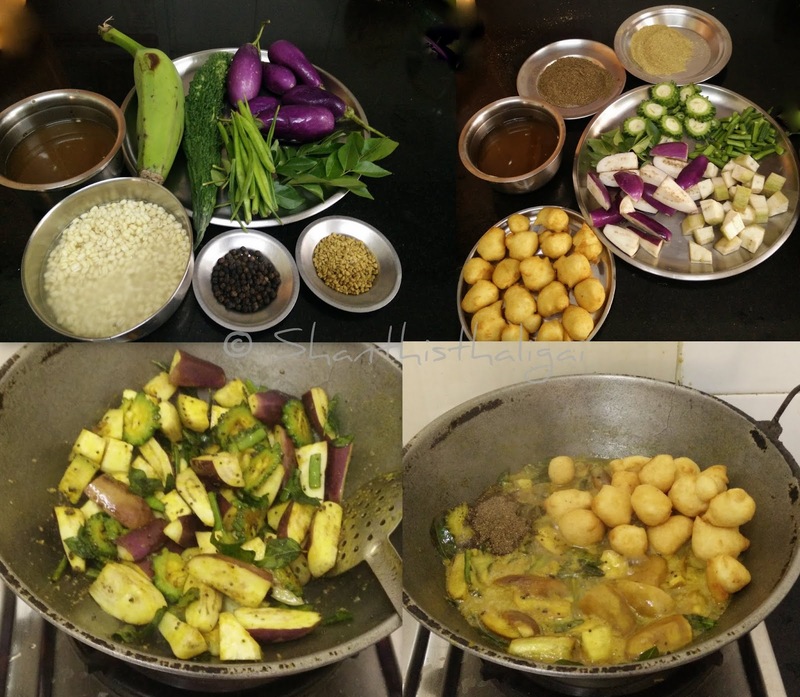 Few years ago, I came to know about this recipe from Preethi's blog. I was very much interested in knowing the history and details about the prasadam, when it is made etc. Recently I visited Thirukoshtiyur and I was having in mind to ask in the 'temple madappalli' (temple kitchen) about the prasadam, but forgot to ask. I felt very sad. Since then, I asked many people about it, but no one knew it. One of my FB friend told me to ask Vembu mama from Thirukoshtiyur. I asked him and in a few days, Vembu mama messaged me about the recipe and details. Both Preethi's and Vembu mama's recipes nearly matched. I was very happy and tried it at home with great interest and offered it to "Aathu Perumal". Thanks Preethi and Vembu mama. _/\_ _/\_ . If anyone knows such unique prasadam recipes of Perumal koil, please feel free to mail me about the history, details and recipe. Black pepper - Dry roasted and powdered - 3 tsp. Fenugreek seeds - Dry roasted and powdered - 2 tsp. Pressure cook raw rice with 1 1/2 cups of water. Wash vegetables. Slice bittergourds, chop cluster beans to 1" long piece and other vegetables to chunks. Soak tamarind in a cup of water and extract juice. Dry roast black pepper until it crackles, powder and keep aside. Dry roast fenugreek seeds until golden brown, powder and keep aside. Soak urad dhal for 45 minutes, drain water completely and grind it to a smooth batter, add salt and mix well. (Only salt is added to the batter and no other spices are added). Take out small balls and deep fry in oil until golden brown and keep it ready. In a heavy-bottomed pan, heat oil and ghee, temper with the items given in "to temper". Add the chopped vegetables, add salt, saute well. Add tamarind extract and allow it to boil until the raw smell is diffused. The vegetables should not be overcooked. Now add urad dhal vadais(bondas) and black pepper powder and allow it to boil for 2 minutes. Mash the cooked rice VERY SLIGHTLY,(should not become mushy) and add to it. Add little salt for the rice and mix well. Add little more water if necessary. The prasadam should not be too watery or too dry. Now add the fenugreek powder, mix well and stir for a minute. 'Thirumaalai chamba' is ready. Offer it to Perumal and partake the prasadam. Looks very interesting shanthiji! ! So true, we can never replicate the divinity in the temple prasadam!! I m bookmarking this to try!! It is not kadamba sadham. looks very appetizing and I am going try it this weekend. Shanti tried this and came out very well - my family members loved it. Wonderful recipes..That too rare ones of kovil prasadam taditional recipes are a boon to learn and offer to God and have as prasadam. I have tried most of your recipes and have turned out perfect. Thank you so much for your posts and wishes / prayers to publish more in future.